Coppicing is a traditional practice of environmental management used by the basket weavers all over the world. It involves cutting the willow plant back to its base and removing the weak shoots to encourage vigorous re-growth. The willow plant is allowed to re-grow from the cut stumps. Willows are coppice to stimulate the propagation of newly formed long, slender, and flexible branches or shoots that will in a year or two grow into a willow stick big enough to be woven into various types of willow garden products . Coppicing provides an environmentally sustainable source of willow withes through periodic cutting, which actually prolongs the life of the tree. Besides preserving traditional skills, coppicing creates a rich mosaic of habitats, attracting a diverse range of flora and fauna. After gathering, the willow withes are left air dried in the shade and then reconstituted later for use. This creates a finished twined willow product that is stiffer and tighter. 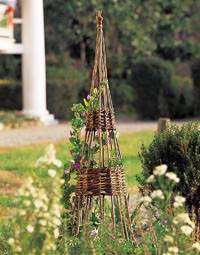 To reconstitute the willow, completely submerge them in a container of water for about a week or soak them in a hot water for to soften the sticks before weaving. Willow sticks can be harvest every year, and it grow on marginal land where no other cash crop will crop, it is a rapidly renewable material.